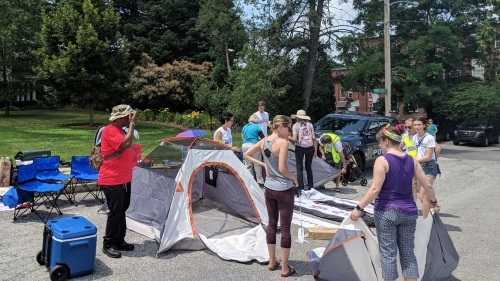 FDPA and March on Harrisburg have been protesting Governor Wolf, demanding that he call the PA General Assembly back for a special session to pass a redistricting constitutional amendment before the clock runs out sometime this month. I will point out in a moment that the focus on Governor Wolf is misplaced and potentially dangerous. But the deeper problem is that calling the General Assembly back into session makes no sense if you don’t have a reasonable goal for them to accomplish and, importantly, a strategy to attain that goal. Here the reform groups differ, although the actions of both of them are problematic. We support that goal. But we see no way to make it reality. A majority of the House – with far more Democrats than Republicans – have co-sponsored it. But the leadership of the House so far will not support it. And when Senate Democrats tried to pass it, all Senate Republicans voted against it. FDPA says this is progress, which we take to mean that the group would once again accept the Folmer redistricting plan rather than the original Samuelson plan. But as we – and March on Harrisburg – have pointed out, the Folmer plan is faux reform. It would give the majority party, which for the foreseeable future will be the Republican Party, control over redistricting for both congressional and state legislative districts. Were it to pass this year and next and then be adopted by the voters – and they rarely vote no on a constitutional amendment – we would be stuck with this disastrous plan for generations. Why has FDPA retreated again from supporting real redistricting reform? We are loath to speculate about their motives. But it appears that they either still don’t understand why the Folmer plan is bad, despite their own consultants from the Brennan Center telling them to reject it, or they are desperate to claim victory. So, March on Harrisburg has no strategy for victory if the General Assembly returns. And FDPA has a strategy that could lead to a disaster if it returns. Thus, we question the wisdom of encouraging Governor Wolf to call them back to Harrisburg. We are also concerned about the General Assembly enacting other pernicious legislation if it returns to the Capitol. Nothing keeps them from running a regular legislative session once they return to Harrisburg at which they could pass destructive legislation like work requirements for SNAP and Medicaid. We also question why FDPA and March on Harrisburg have been spending the last few weeks focused on asking Governor Wolf to call the General Assembly back into session to enact redistricting reform. This effort is wholly misguided. The governor’s action is neither necessary nor sufficient to enact redistricting reform. His commitment to redistricting reform is unquestionable, as was shown by the critical support he gave the effort to revise congressional districts this year. If anyone is to blame for the impasse on redistricting reform, it is the Republican leaders of the General Assembly. They have the power to call the House and Senate back into session at any time. And their unwillingness or inability to secure the Republican caucuses to coalesce in support of genuine redistricting reform is the major barrier to progress. All of us who support redistricting reform should be putting the onus on the Republican leadership of the General Assembly, not Governor Wolf. But FDPA and March on Harrisburg seem determined to be “nonpartisan” not matter what violence that stance does to the truth and good political strategy. We are a nonpartisan organization, as well. But being nonpartisan does not require advocates to ignore reality. And the reality is that the Republicans have controlled the General Assembly for years and have consistently sought to restrict our democracy by, for example, enacting Voter ID laws and by gerrymandering congressional and state legislative districts. Just this year, the Republicans have undermined the goal of redistricting reform multiple times. To begin with, most of the supporters of the good redistricting bills introduced earlier in the year in the House, HB722, and Senate, SB22, were Democrats, along with some Southeast PA Republicans. Then, Republican Chair Daryl Metcalfe with the support of Republican members of the House State Government Committee mangled HB 722 beyond recognition. Much the same thing happened in the Senate, where the Republican chair of the Senate State Government committee, Mike Folmer, led an effort to amend SB22 in ways that gave the General Assembly far too much control over the redistricting process. On a straight party line vote, all Republicans voted against an effort by Senator Vince Hughes to fix the Folmer plan. And then, adding insult to injury, the Republicans, in another straight party line vote, added an amendment by Senator Aument that would have enabled the majority party to gerrymander newly-created districts for the election of appellate court judges in the state. Democrats did develop an amendment strategy to kill the Senate-passed SB22 in the House. But that was the only way to kill a very bad bill – one that FDPA unconscionably supported. It was the right strategy and, should the General Assembly come back to Harrisburg, we would urge legislators to do the same thing again. That is the reality. When March on Harrisburg and FDPA blame “both sides” for the failure of redistricting reform, they are creating alternative facts that are far-removed from the reality we have seen this year. And all the good intentions can’t rescue a political strategy from creating disaster when it is based on a seemingly willful misreading of the political circumstances in which we live.